For over 15 years we have been one of the leading producers and marketers of imprinted promotional calendars sold via the Internet. Our vast experience in the calendar publishing business has existed since 1987 allowing us to become one of the leading authorities on calendar production found anywhere in North America. 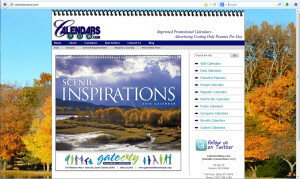 Check out our dedicated website at: www.CalendarsNow.com for additional details on over 500 stock promotional advertising calendars for 2015, as well as many custom calendar options. All orders placed before 7/1/14 using PROMO CODE: EOD14 will receive a 10% discount off the base calendar pricing, with the option for delayed billing and shipping.